UT Idea Lab | Join EstLat-Accelerate programme! EstLat-Accelerate pre-acceleration program announces the applications for the second batch! The five partners University of Tartu, TechHub Riga, Startin.LV, Garage48 and Baltic Innovation Agency are joining forces again to bring you the tailored-made pre-acceleration program for Estonian and Latvian early stage startups! Apply by the March 11 and raise your startup idea from the ground. The program suits best early-stage startup projects, who need to validate their idea and test the team before diving into the process with full speed. 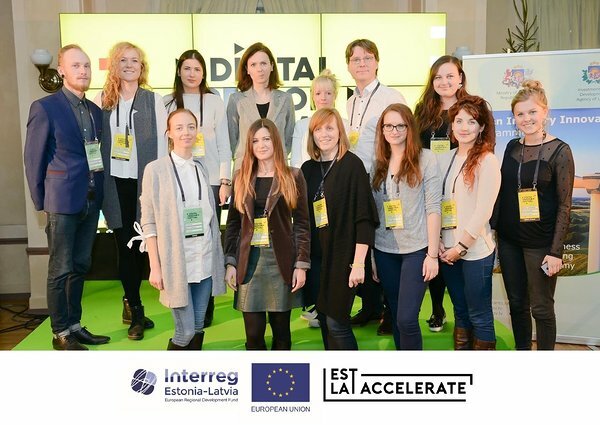 EstLat-Accelerate consists of joint workshops both in Tartu in Riga on topics such business development, marketing and pitching, followed by one-on-one mentoring speed sessions and meetings with coach to monitor your process. Before the official beginning of the pre-acceleration program, there will be an open hackathon Garage Hardware&Arts in Tartu, which is not mandatory for the participants, but a good challenge to take on. The official start of the program is on March 23 in Riga, the program will last about two months and finish with two Demo days in Riga and Tartu in mid-May. To register please read more information HERE and fill in the application form HERE by March 11. The programme is implemented under the European territorial cooperation goal of the cohesion policy and it supports cross-border cooperation. The programme is co-funded by European Regional Development Fund (ERDF), the Republic of Estonia and the Republic of Latvia.